Harry M Miller was an Auckland showman, businessman and impresario who would turn his hand (not always successfully but always with great flair and gusto) to anything he thought would make money, thus in 1959, as other NZ-owned labels found success, he decided to launch his own record label. He named it La Gloria, as it sounded exotic and it was a name also used by a range of radios and record players made by Auckland company Dominion Radio and Electrical Corporation, who were happy with the association given the label's growing success. Initially, promoter Graham Dent was Miller’s partner in the venture, leaving in 1962. La Gloria's office was at 12 O'Connell Street in Auckland's CBD, also the home many of Miller's other wide-ranging ventures. The first releases were American motivational releases but Harry Miller and Graham Dent had their eyes fixed closer to home. Miller was also the brand new manager of the Howard Morrison Quartet who had already had several large hits for Eldred Stebbing’s Zodiac label and the group were taking the country by storm, not least because of Miller’s keen eye for every commercial opportunity – at one stage he had Howard selling washing machines. Taking advantage of the fact that Stebbing had no contract with his newly acquired charges, he quickly moved them to his own label, where Miller had them releasing 28 singles, seven EPs and nine albums over the next four years. Stebbing didn’t take this easily and a court action resulted in Miller having to destroy large numbers of Quartet pressings for copyright breach in 1962, ensuring on-going enmity between the two label owners, something that was never successfully resolved. 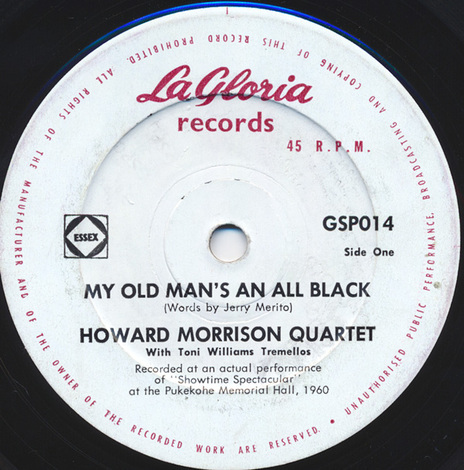 The Howard Morrison Quartet single of "My Old Man's An All Black", a mild protest remake of a current UK Lonnie Donegan hit ('My Old Man's A Dustman'), allegedly sold in excess of 60,000 copies making it one of the biggest New Zealand recorded singles ever. The record was recorded live at the Pukekohe Town Hall on the last night of La Gloria's massively successful Showtime Spectacular tour in 1960. Between 1960 and 1962 La Gloria also issued 13 singles, six EPs and two albums by Antoni "Toni" Williams, a Rarotongan star who was part of the Howard Morrison Quartet touring troupe. The label also had a string of massive hits with US twister Chubby Checker in 1962, having taken the Cameo label from Allied International and in 1960 also briefly had a subsidiary label, American La Gloria, for licensed records although its first release was a quick cash-in of the then current smash 'Itsy Bitsy Teenie Weenie Yellow Polka Dot Bikini' by an anonymous someone called Ronnie Paul who may or may not have been Howard Morrison under a pseudonym. Miller always had his eye on the quick dollar (or shilling as it was then). Harry Miller also recorded two EPs with the NZ Jazz Trio: Les Still on bass and xylophone, Tony Thiels on piano and vibraphone, and Mauri Fairs on percussion. The first featured the trio playing hits from the shows, and Miller interspersed the tracks (among them 'Bali Hai' and 'Anything Goes') with advertising, in which a voiceover extolled the virtues of an electric frypan distributed by Miller! 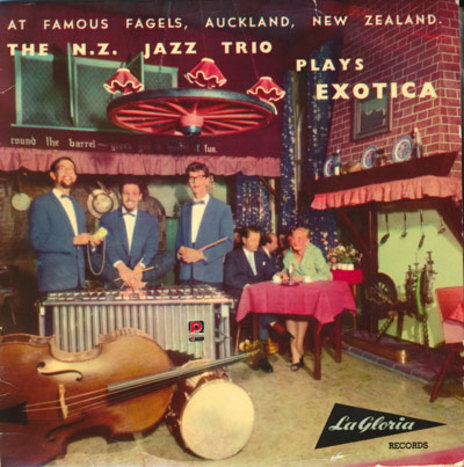 The second EP treated the musicians with more dignity; The NZ Jazz Trio Plays Exotica followed the trend for hi-fi musical gimmicks popularised by Martin Denny, and Miller splashed out on a colour picture sleeve showing the trio in Fagel's restaurant, Auckland, where they had a residency. La Gloria was nothing if not prolific, also recording Ricky May, Gray Bartlett and Bob Paris before Miller decided he wanted to head to Australia in 1963. Things were already strained both within the Quartet, and increasingly between the group and its pushy manager, so La Gloria was put on the market by the new partner Anthony Hollowes, allowing Miller to concentrate on his growing – and to him, more important – international touring business. Eventually, at the end of 1963, the label was sold to Viking Records, who kept it going for a few years, releasing records by The Dallas Four and Tom Thumb before finally folding it into the parent in 1967. Thanks to the Howard Morrison Quartet and Toni Williams, both of whom sold substantial quantities of records for La Gloria, the label's logo is still a familiar one in the 21st Century and second-hand stores and online markets are rarely without La Gloria listings or stock. It remains one of the most successful NZ record labels of all time. Miller quickly established himself in Australia, where he became both famous as one of the biggest promoters in the country with a global reputation, and controversial following a 10-month spell in jail for ticket fraud. A household name, well regarded by most he had worked with over his long career, in which La Gloria Records was but a tiny part, he passed away on 4 July 2018.